MCLEAN, VA, October 22, 2013 /3BL Media/ - Mars, Incorporated announced today that it has been recognized as one of the World’s Best Multinational Workplaces by Great Place to Work®. The ranking is the world’s largest annual study of workplace excellence and identifies the top 25 best multinationals in terms of workplace culture. Ranked 22 this year, Mars’ position on the list rose by 3 places from the inaugural list in 2012. In addition to the special recognition of women leaders, Mars, Incorporated was also recognized for its unique approach to business and strong Principles-led working culture. For example, Associates new to the business are embraced through an “Essence of Mars” course, which aims to provide the foundation for early success in their careers at Mars. Training courses are available globally, in 22 languages and aim to support Associate development and understanding of how to apply Mars’ Five Principles of Quality, Responsibility, Mutuality, Efficiency and Freedom to their work and business decisions. Mars, Incorporated’s commitment to providing workplaces that are safe, healthy and positive for all Associates so that they feel engaged and motivated. Providing a unique learning and development program through Mars University, with more than 40 percent of Associates participating in learning programs worldwide equivalent to 400,000 learning hours every year. Celebrating Mars Associates’ commitment to making a difference to people and the planet through performance by putting Mars Five Principles into action through their work or community engagement. Mars, Incorporated’s annual ‘Make The Difference’ Awards shines a light on these successes and as testament to the scale and inclusivity of the awards, approximately 26,000 nominations were submitted for recognition in 2013. Other key programs include the Mars Volunteer Program where in 2012, more than 12,500 Associates volunteered more than 50,000 hours. Additionally, the Mars Ambassador Program (MAP) enables up to 100 Associates to spend between one and six weeks all over the world improving Mars’ communities and developing their own leadership skills. To qualify for the list, Mars, Incorporated, alongside other qualifying companies were required to feature on at least five national Great Place to Work lists, have at least 5,000 Associates and have at least 40 percent of their workforce located outside the country in which their company is headquartered. Nineteen of Mars, Incorporated’s operations are featured on national Great Place to Work lists including (with ranking as applicable): Argentina(6), Austria(4), Belgium(5), Brazil(24), Central America(5), Chile(8), Denmark(14), Finland (8) France(3), Greece(5), Ireland(1), Italy(3), Japan(25), Korea, Poland(7), Portugal(7), Spain(10), Switzerland(9) and USA(95) and being featured 16th on the 25 Best Multinational Workplaces in Europe list as well. In 2013, Mars was also featured on other national workplace lists including United Kingdom (58 in Times Top 100 Employers), Mexico (6 in Super Empresas), Thailand (Aon Hewitt), Australia (Aon Hewitt). Since launching the first best workplaces lists in partnership with FORTUNE magazine in the United States and Exame in Brazil in 1997, Great Place to Work® now recognizes leading workplaces in nearly 50 countries. The World’s Best Multinational Workplace list is based on a pool of data from some 2,900 companies that were listed on Great Place to Work® country lists. Every year, Great Place to Work® analyzes data from surveys taken by more than 5 million employees and workplace culture analytics taken from 7,200 companies, which represent more than 16 million employees. In 1911, Frank C. Mars made the first Mars candies in his Tacoma, Washington kitchen and established Mars’ roots as a confectionery company. In the 1920s, Forrest E. Mars, Sr. joined his father in business and together they launched the MILKY WAY® bar. In 1932, Forrest, Sr. moved to the United Kingdom with a dream of building a business based on the objective of creating a “mutuality of benefits for all stakeholders” – this objective serves as the foundation of Mars, Incorporated today. Based in McLean, Virginia, Mars has annual net sales of more than $33 billion, six business segments including Petcare, Chocolate, Wrigley, Food, Drinks, Symbioscience, and more than 72,000 Associates worldwide that are putting its Principles into action to make a difference for people and the planet through its performance. Mars brands include: Petcare – PEDIGREE®, ROYAL CANIN®, WHISKAS®, KITEKAT®, BANFIELD® Pet Hospital and NUTRO®; Chocolate – M&M’S®, SNICKERS®, DOVE®, GALAXY®, MARS®, MILKY WAY® and TWIX®; Wrigley – DOUBLEMINT®, EXTRA®, ORBIT® and 5™ chewing gums, SKITTLES® and STARBURST® candies, and ALTOIDS® AND LIFESAVERS® mints. Food – UNCLE BEN’S®, DOLMIO®, EBLY®, MASTERFOODS®, SEEDS OF CHANGE® and ROYCO®; Drinks – ALTERRA COFFEE ROASTERS™, THE BRIGHT TEA COMPANY™, KLIX® and FLAVIA®; Symbioscience – COCOAVIA®, WISDOM PANEL® and SERAMIS®. 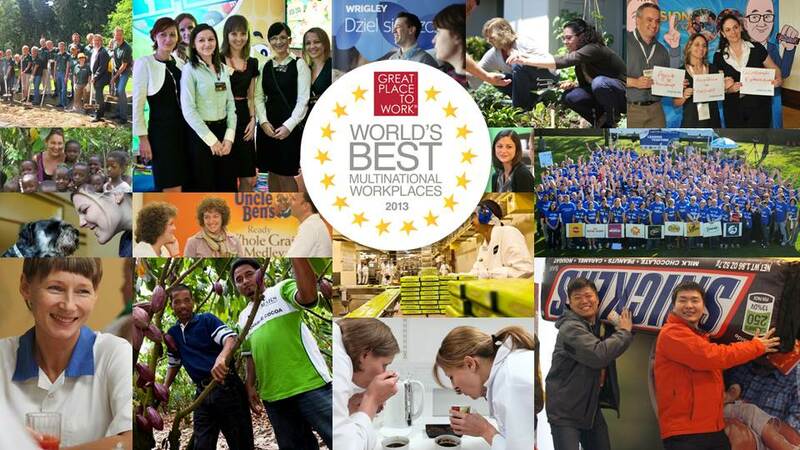 Great Place to Work’s annual World’s Best Multinational Workplaces List ranks the top 25 global companies to work for. Qualifying companies must have been selected for at least five national Great Place to Work® lists, have at least 5,000 employees worldwide and count at least 40 percent of their global workforce outside of the company’s home country.